13 views of Fuji Terebi, Odaiba, mimics a well-known tradition in Japanese art: collected ukiyoe (wood-block) paintings of Mt. Fuji from multiple locations and angles, in varying weather conditions. This style of art became famous with a collection of 36 prints from artist Katsushika Hokusai around 1830, copied many times by many different artists in many different styles. 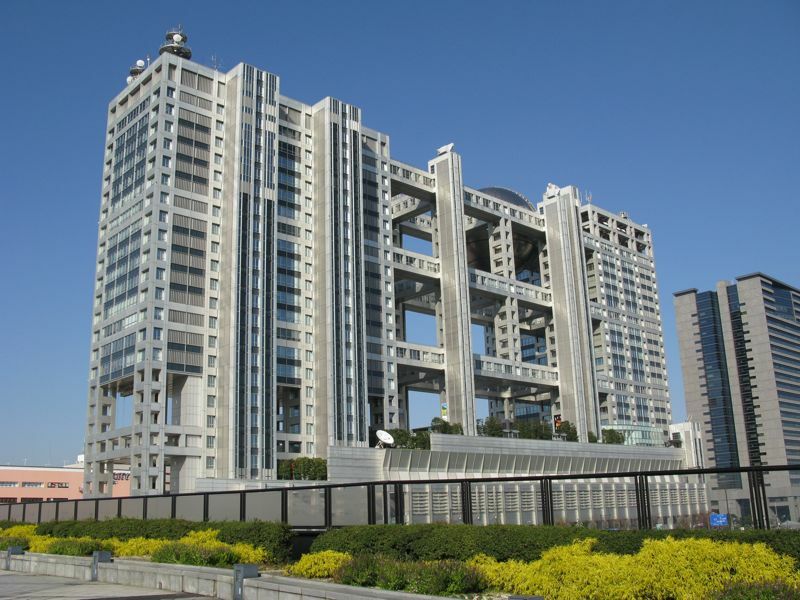 Here- I add my take on it, with the Fuji Terebi (television) building in Odaiba. 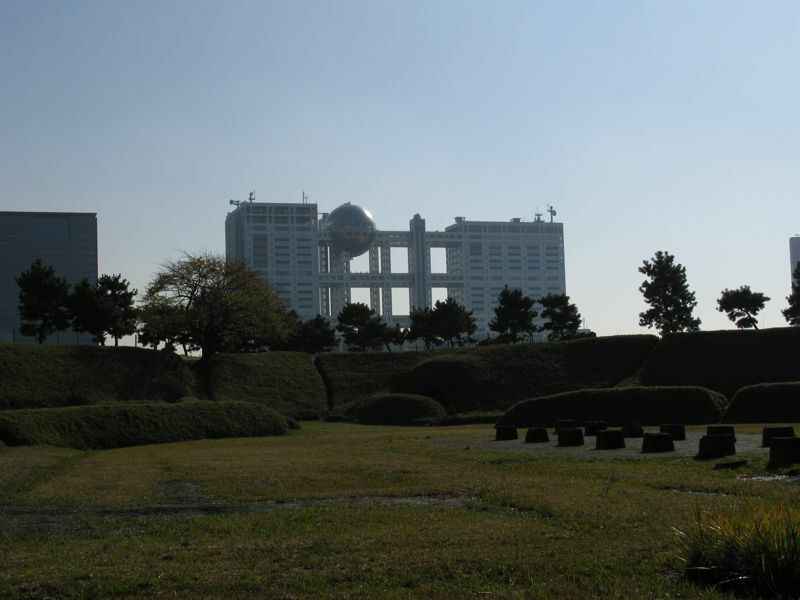 The Fuji Terebi building is huge, bizarre, and dominates the skyline of Odaiba from all angles. It was designed by architect Kenzo Tange who also designed the Tocho- the main twin-towered government building in Shinjuku. 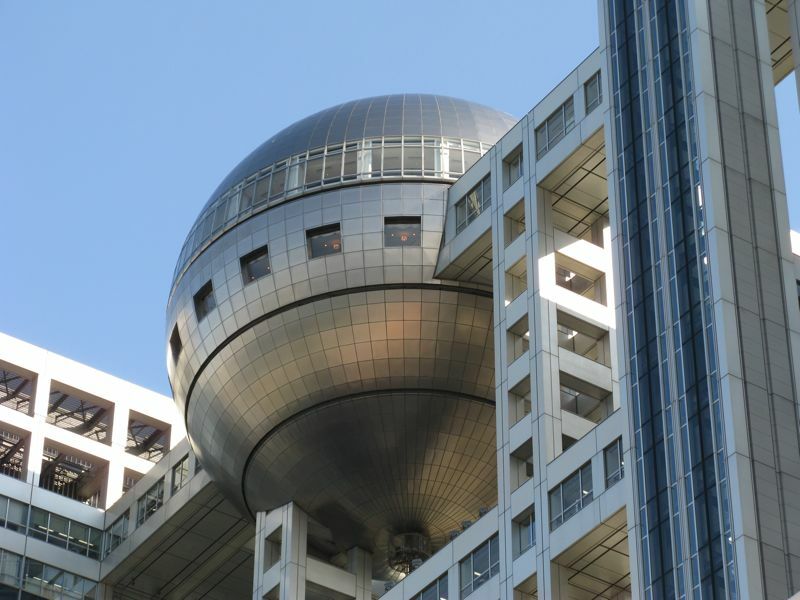 On the 25th floor there’s an observation ball which gives the building its distinctive shape, and can be visited for 500 yen. Fuji Terebi is the funky TV channel in Japan with all the young-people type shows, things like ‘Ai Nori’- the only J-reality show I know of, where young people get on a pink bus and travel round the world together with cameras. ‘Ai Nori’ means ‘love ride’, and the goal of the hip young things on board is to find love amongst each other. When they think they’ve found a willing partner- they ask them to leave the bus together. If the partner agrees, they leave together. If they are rejected, they have to leave the bus alone. 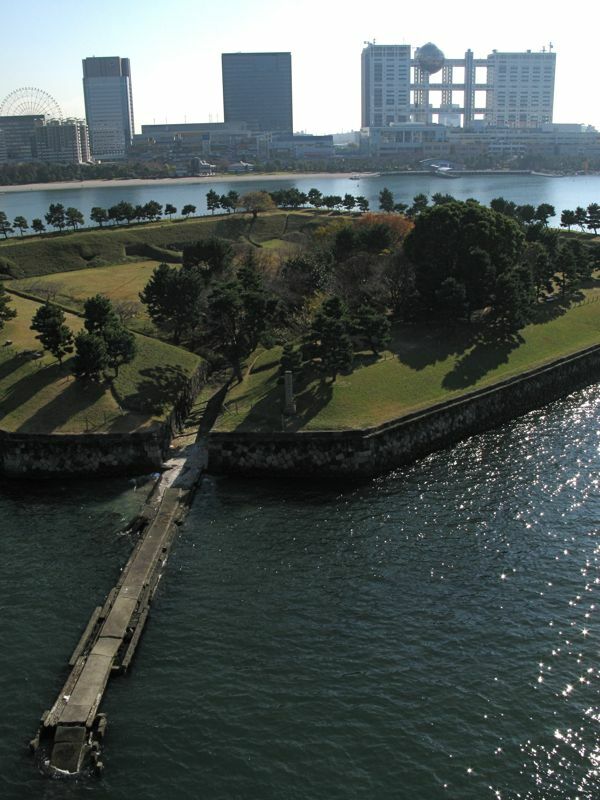 Fuji Terebi sits on a partially artificial island in Tokyo Bay called Odaiba, which means ‘cannon mount’ or ‘cannonade’. It was named after a network of 6 defensive cannon-islands that were built across the Bay in 1853 to protect against foreign invasion, after earlier that year American Colonel Matthew Perry steamed up the Bay with a fleet of black-iron frigates to force open Japan for trade. Japan had been completely unprepared for Perry, and was unable to stop him from landing and demanding delivery of a letter from US President Filmore insisting on free trade. They acquiesced, the letter was received, and when Perry visited again the following year with twice as many ships, he found that most of his conditions had been met, and so Japan opened her ports to trade- beginning the process of Westernization that we see still taking place today. Fuji Terebi from across Tokyo Bay, close to Tennozu Isle. I walked here after teaching a class in the morning. Tennozu Isle itself is artifical, and built over one of the previous defensive cannon islands. 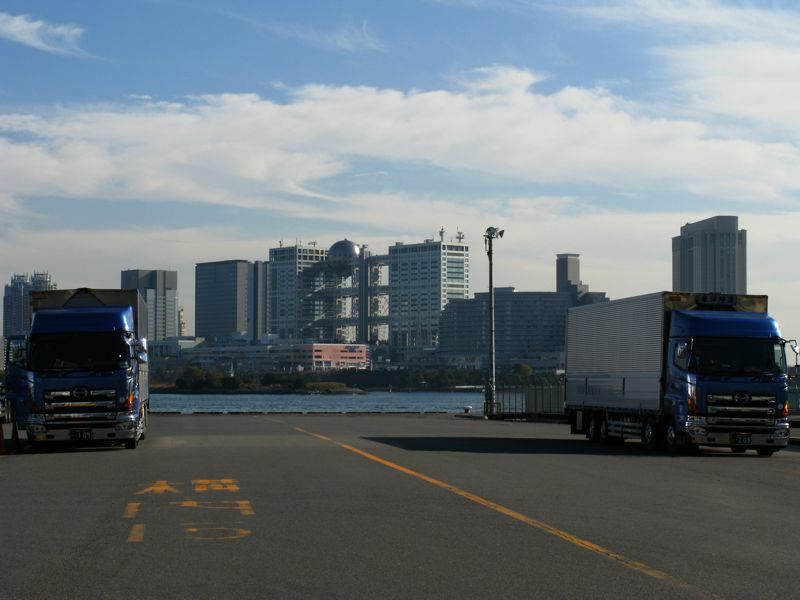 Further round the Bay, flanked by two trucks- this whole area is for shipping and storage of goods, along with a few cement factories. Coming round close to where the Immigration Bureau is, an interesting enough building in its own right, I spy Fuji Terebi in a break between the buildings. 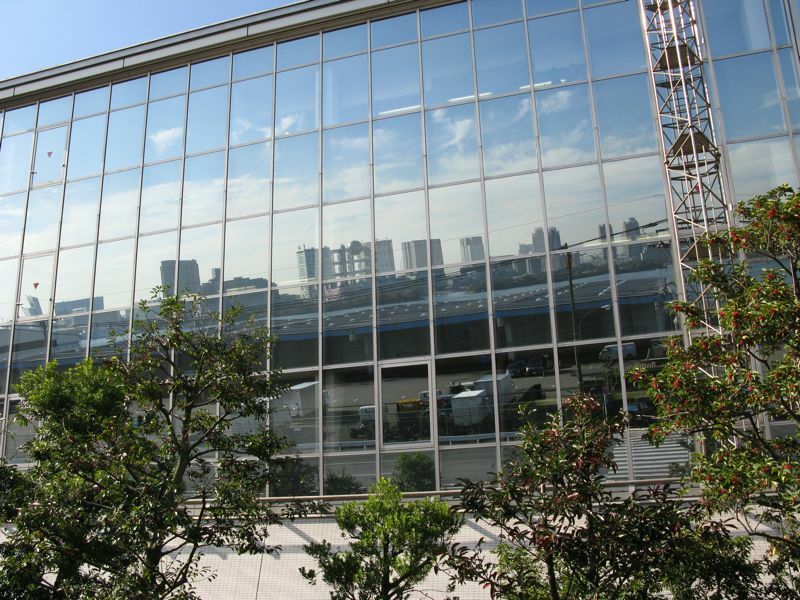 In the reflective glass of a warehouse facility. 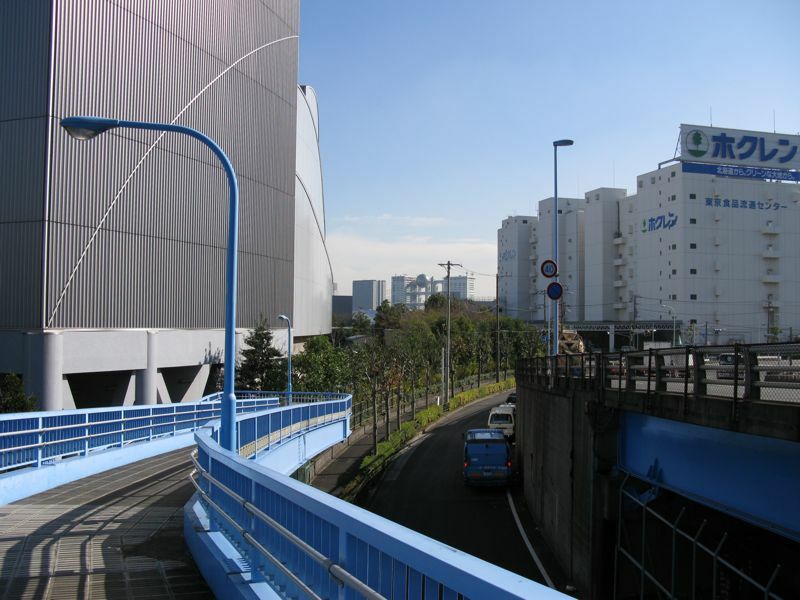 With the Rainbow Bridge spiral access ramp on the left. Through the grill on the South side of the Rainbow Bridge. The bridge shakes a lot with passing traffic, making it quite difficult to get a good shot. Here we’re focused on the grill- would be impossible to jump off any part of the bridge, at least for the tallest two thirds of it. Some kind of boom-arm swings out from the bridge, Fuji Terebi dominates the island- Cannon-mount island number 5 in the water before it. Cannon mount island number 5. From the pit of cannon-mount island No. 5. On the right are stone foundations, and all around are iron-grilled shallow bunkers. From an artificial beach under some pine trees. From behind, the view from the land-side. The Peace Tower behind Fuji Terebi. Entry – None, not enough time, though learned afterwards you can go up to the observation ball for 500 yen. Architect – Kenzo Tange, the same guy who buil the Tocho in Shinjuku. 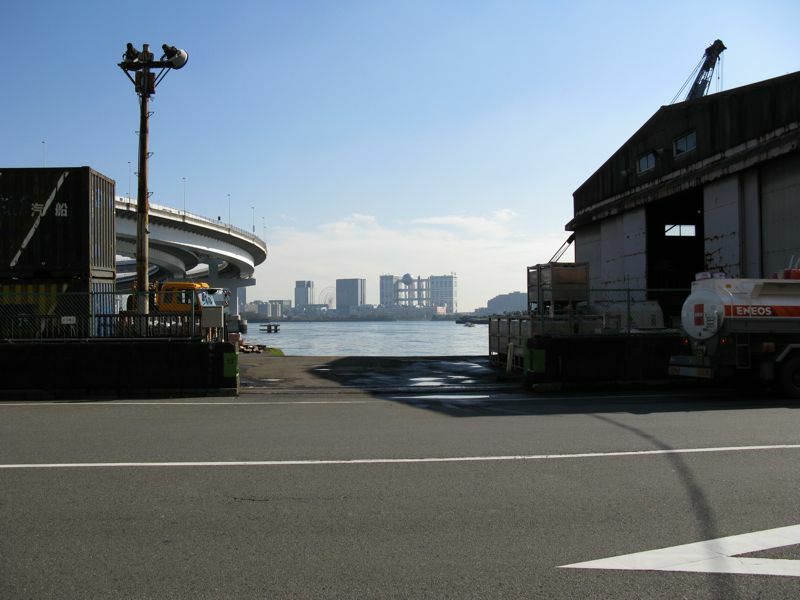 Highlights – Crossing the Rainbow Bridge for the first time, learning about the cannon-islands, having an ice-cream on the artificial beach as I cruise towards Fuji TV. What an interesting thought. 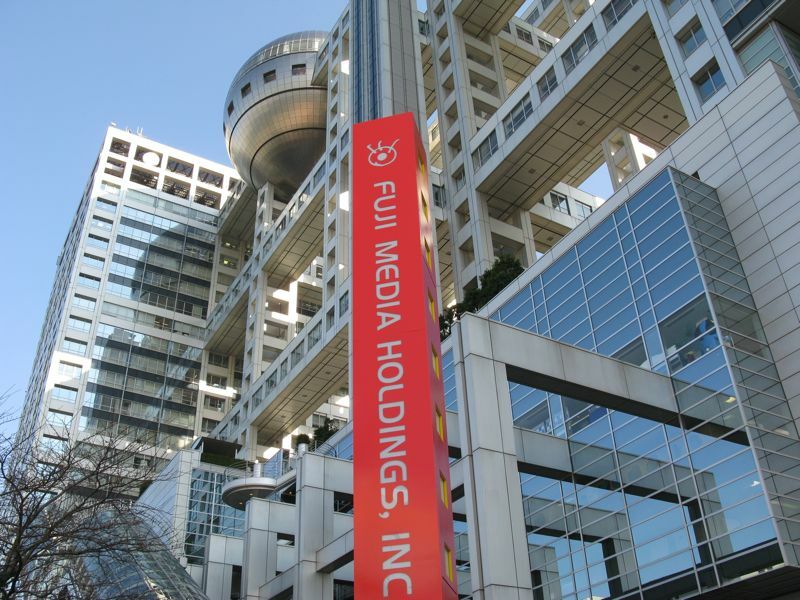 Fuji TV was always one of those great landmarks for me, when living in Tokyo. Visitors would always ask about it, and wonder why it wasn’t featured in guidebooks, since the structure is so extraordinary. Now, your 13 views of Fuji TV should include 13 night views, too. That looks good! Have you been up to the round observation deck before? Headbang8- I too have always been interested in Fuji Terebi, but until I actually researched it I didn’t know you could go up to the observation sphere. 13 night views, true, good idea, perhaps I’ll add that if and when the circumstance present themselves. Any other favorite notable Tokyo buildings? Kelly- Thanks, and no, I haven’t been up before- I didn’t know it was possible to do so until recently. What’s up my friend? 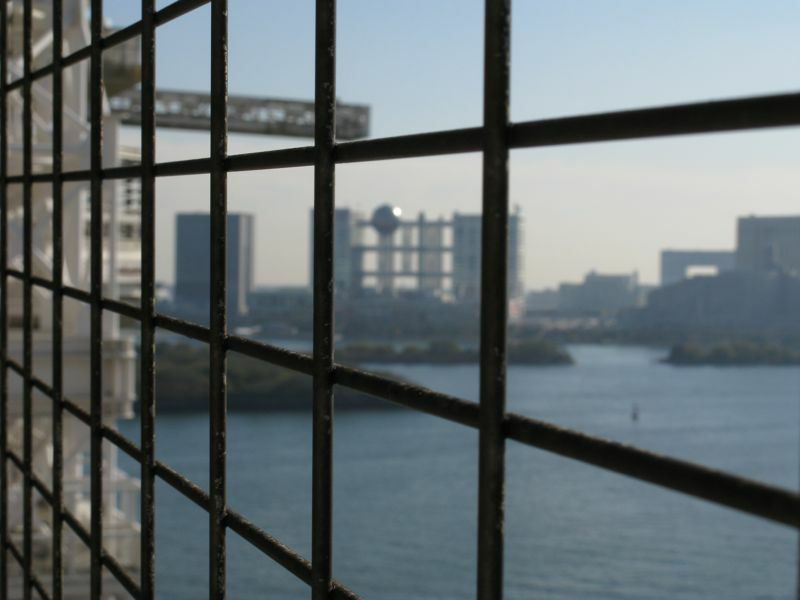 I have some very fond memories of Odaiba (I took a lot of dates there the first year I was living in Japan). 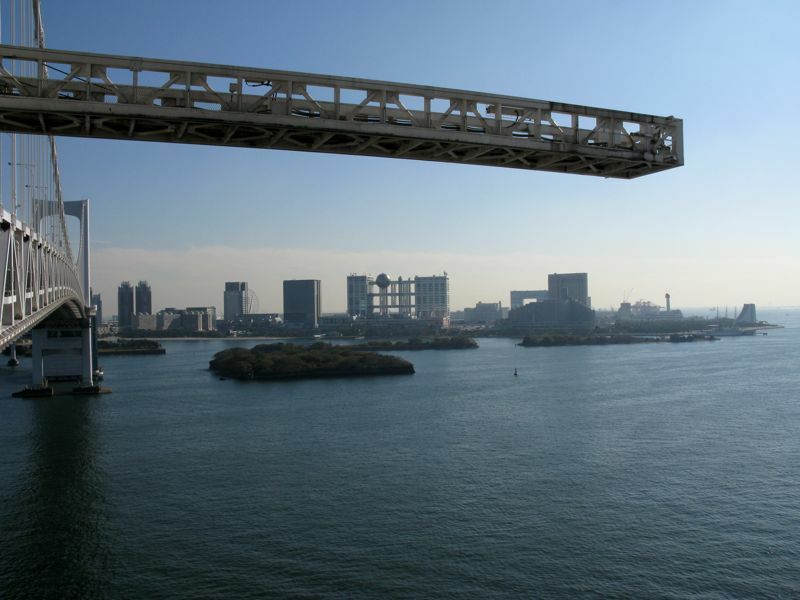 One of the most surreal experiences there occurred on one of my days off when I visited Odaiba by myself. 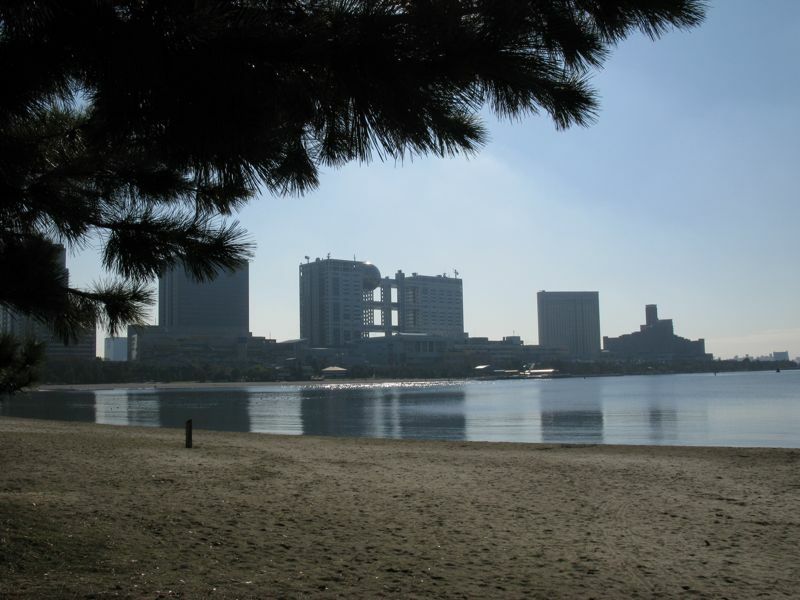 I was walking along that artificial beach and a massive rain storm occurred (drizzle to Westerners but a down pour to Nihonjin). It suddenly became extremely post apocalyptic all signs of life excluding me and some birds disappeared and I was all alone in a city of 33 million people. No cars moving on Rainbow Bridge no one walking outside of near the windows of the shopping center perched above the beach. Only the 1/5 scale copy of the Statue of Liberty and I standing on the beach. At which point I truly understood Charleston Heston in Planet of the Apes. We went there when i visited. I have lots of pics too. 13 views of the Dentsu Building in Shiodome–or Shiodome in general. 13 views of Hachiko Square, Shibuya. A monumental presence, in its own way. My wife loves the show Ai Nori. She tapes all of them. It seems like it is on everyday. Aaron- Hey buddy! 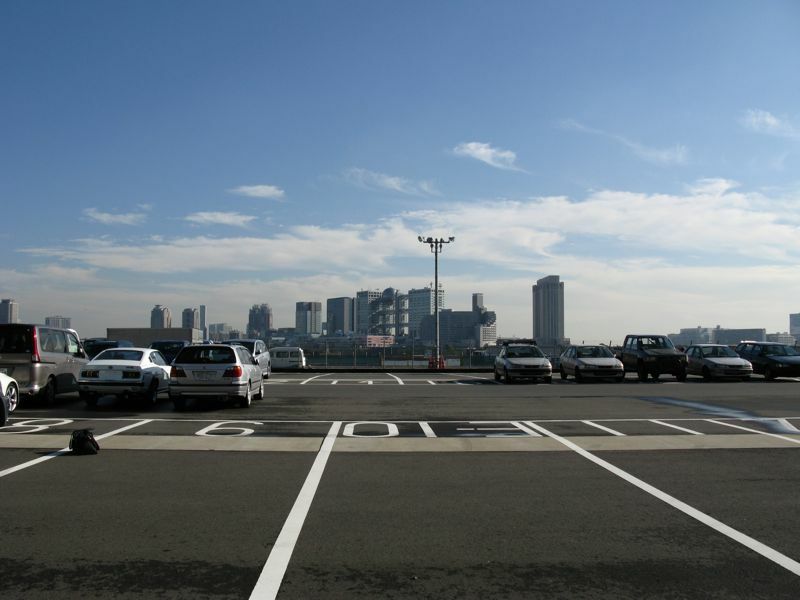 Great you found your way to my site, and thanks for sharing the odd experience in Odaiba. I had a similar thing once in the States with rain, I was on a package tour up the West coast with a van-ful of people, driving through some desert in Nevada or such, and a sudden very heavy rain-storm fell on us. we were listening to something poignant like ‘All Along the Watchtower’. We drove on barely able to hear ourselves think for the music and the banging of fat raindrops on the roof. Of course there was no-one else on the road. We looked around at each other and shared the moment. Then we drove out of the rain, and it was as if the moment never was. Alice- You went there with one of the school’s students, right? Headbang8- Wow, impressive list of ideas. Also I like the tag of them all being ’13 views’- that hadn’t actually been the plan, but now that I see it laid out like that, it seems like a cool tag to hang the series’ hat on. Some of these buildings I already have my sights set on- City Hall, Tokyo Station, Dentsu. But the others I’ll have to look into- thanks. The Novotel- do you mean the Sofitel, that was like a half-open chest of drawers? If so, unfortunately it was demolished a few years back. What a shame. Tornadoes- Ai Nori! you get that in the States? I’ve watched it a few times and it seems fun- I wish I could get it as a podcast to watch on the train. Really great pictures! Such an interesting building (and, going inside is fun too, seeing sets for my favorite variety shows, etc.) I thought for sure there would be a view from the ferris wheel though! mo- Thanks, and shots from the ferris wheel- great idea, wish I’d thought of it! I spent so much time walking round the Bay though I didn’t have time for it- nor even to go inside and get the good shot you’ve linked to. I was lucky with nice blue skies- though it’s hard to shoot from across the Bay cos the sun is pretty much behind the building all the time. Yes, it was the Sofitel. Torn down? Really? Friends of mine stayed there as late as 2004. The rather tall hotel only held 80-odd rooms, so I guess it was an extravagant use of space. And definitely not in the right neighbourhood for an international hotel. 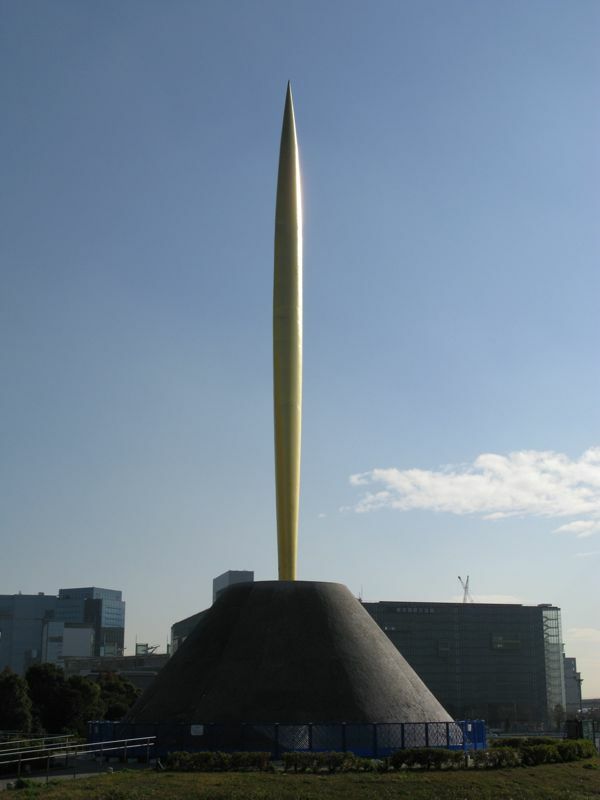 One hopes that the design wasn’t judged too seismically risky, after the fact! Headbang 8- Yup, it’s gone, I couldn’t find online why, but suspect it’s as you said- not a great location for an international hotel.